To Cite: Jamalpour M R, Imani M M, Saffar Shahroudi A, Oladzadeh S. The Frequency of Temporomandibular Disorder (TMD) in Boxers, With Membership Record in National Team of the Islamic Republic of Iran, Iran J Ortho. 2015 ; 10(2):e5033. doi: 10.17795/ijo-5033. Background: Facial trauma is a common sport-related injury and risk of this injury in contact sports is greater than non-contact sports. Facial trauma has been suggested as a possible etiologic factor of temporomandibular disorder (TMD). Objectives: The purpose of this study was to investigate the frequency of TMD and its clinical manifestation in boxers of Islamic Republic of Iran national team. Materials and Methods: In this study, thirty-two male players with average age of 23.75 ± 2.21 who were playing boxing more than 6 years were evaluated regarding TMD. After taking the history, a clinical examination was performed for each athlete. The presence of at least a sign or symptom was considered as TMD diagnosis. Data were collected and presented as descriptive findings. Results: Of 32 boxers, 28.1% (9 cases) had TMD and 71.9% (23 cases) were healthy. The most common symptom was ante-auricular pain (25%) followed by neck pain (21.87%) right ante-auricular tenderness (9.37%) muscle tenderness (9.37%), neck tenderness (9.37%) and headache (3.12%). The uppermost sign was right joint click (25%) followed by left joint click (12.5%) and jaw deviation during mouth opening (12.5%).average age of (25 ± 2 years) and boxing record (10.44 ± 2.29 years) of athletes with TMD were higher than average age of (23.26 ± 2.4 years) and boxing record (7.26 ± 1.76 years) of athletes without TMD. 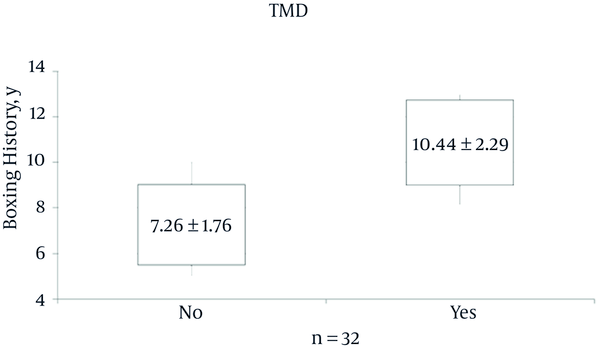 Conclusions: This study showed that the prevalence of various sign and symptoms of TMD is relatively high in boxers which could result from boxing-related facial trauma. The temporomandibular joint (TMJ) is an important part of masticatory system. Disorders of this system varies from a muscular low pain to internal joint damage which include one or a set of jaw muscular tenderness, head and neck muscles tenderness, TMJ pain, limited jaw movements, and muscular noises and face deformation. Bell suggested the term of, temporomandibular disorder (TMD), which was accepted as a comprehensive expression. In fact, TMD is a set of related disorders with function of masticatory system, which only one part of that relates to TM joint disorders. The ethologic factors of TMD are classified as starting factors and interfering factors (factors interfering in intensification or deduction of TMD). Five main factors including: trauma, defective collagen formation, psychic stress, deep pain input, parafunctional activity, are interfering in TMD outbreak (1, 2). Bakland et al. (3) (1998) studied TMD patients, and found that in 42% of the cases, commencement of symptoms of the disorder accompanied by a trauma and 5% of the traumas are in sport. Gorgu, in a provident trauma study in 2002 reported that trauma is a main factor of TMD (4). The study of Yun et al. (5), on patients with broken mandible, demonstrated that TMD after face trauma, inflammation and degenerative changes, which may finally result in biochemical damages, joint internal damages and corrosion of joint cartilage. Mesgarzade et al. in a retrospective study of patients with maxillofacial fractures concluded that road traffic accident was the commonest cause (40%) and the age group of 21 - 30 included the biggest group (30%) (6). An epidemiological study on facial trauma stated that most of the patients were young adult men (P < 0.05) with a male: female ratio of 4:1 (P < 0.05). Interpersonal violence is the most prevalent cause of facial trauma (27.9%), followed by motor vehicle accidents (16.6%). The mandible was the most prevalent facial bone fractured (44.2%), followed by nasal fracture (18.9%) (7). Shirani et al. in his study found that of 120 cases, 95 male cases (79.2%), had at least one traumatic injury to the face requiring medical treatment (8). Based on a report in 1995 of American dentists association, 44% - 49% of TMJ problems are the consequences of trauma (9). Sport-related dentofacial injuries occur with high rate in both contact and non-contact sports and sporting activities has been reported as the most common cause of mandibular fractures, the second most common cause of craniomaxillofacial trauma and orodental injuries (10-12). By understanding the prevalence, signs and symptoms of TMD in sportsmen, some guidelines can be developed for training the players and their physicians to prevent and manage the problems. Boxing is a common contact sports with a high risk of facial trauma. The purpose of this study was to investigate the frequency of TMD and its clinical manifestation in boxers of Islamic Republic of Iran, national team. The purpose of this study was to investigate the frequency of TMD and its clinical manifestation in boxers of Islamic Republic of Iran national team. In the present study, all of the boxers, who were playing more than 6 years of experience in national boxing team of Islamic Republic of Iran, were concerned. Totally 32 males were involved. They were 14 - 28 years old with the mean age of 23.75 ± 2.21 and had 5 - 14 years of sport background, by the mean of 8.16 ± 2.38 for boxing record which are shown in Table 1. All participants were given a consent form before the study then each of them was visited by the study conductors. A questionnaire was designed about TMD symptoms (subjective experience like joint hearing by the person, headache, tenderness in TMJ, …). All of the players were asked to fill out the questionnaire and their answers were recorded. Then, they were examined clinically about existence of TMD problem signs and the data were gathered. The sings included medical facts that indicated by examiner like deviation during maximum opening of the mouth, limitation of maximum opening, joint sound and subluxation. The gathered data were analyzed by SPSS statistical software and descriptive results were provided as diagrams and Tabulation. 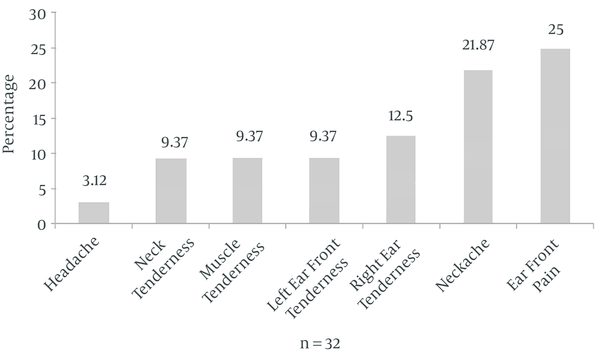 Among 32 athletes participated in this study, the most common sign was an ache in front of ears with 25% (8 cases) and respectively, neck ache 21.87% (7 cases), tenderness in front of the right ear 12.5% (4 cases), tenderness in front of the left ear 9.37% (3 cases), muscle tenderness 9.37% (3 cases), neck tenderness 9.37% (3 cases) and headache 3.12% (1 case) which all are shown in Figure 1. 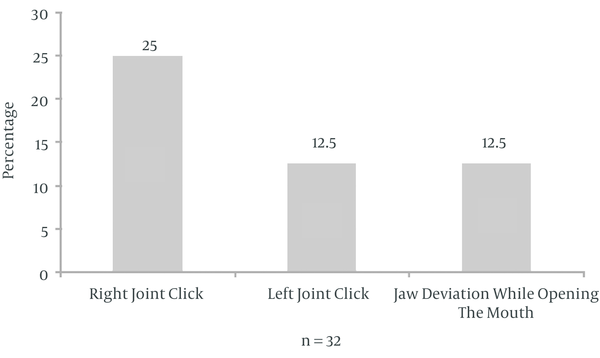 According to Figure 2, the most common signs in clinical examinations in respect of percent reduction are: first of all, clicking of right joint 25% (8 cases) left joint click 12.5% (4 cases) and deviation of jaw during the opening process 12.5% (4 cases). Among 32 studied athletes, 28.1% (9 cases) at last have one sign, in which 2 of them have one, three have 2 and one person has 4, another one has 5 and finally two of them have 6 signs. 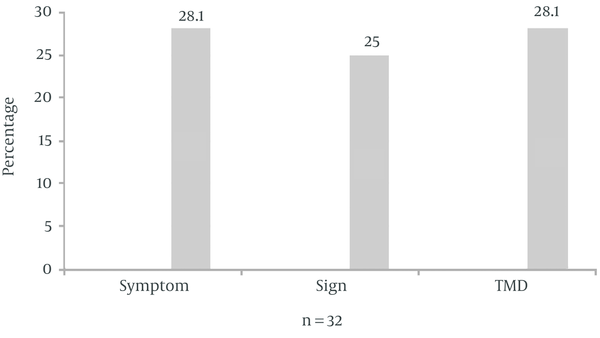 according to Figure 3, frequency of athletes who at least have one sign were 25% (8 person) in which two of them have one, four have 5 sign and two of them have 3 signs. In this study, an athlete who had at least one of clinical sign was considered as TMD. 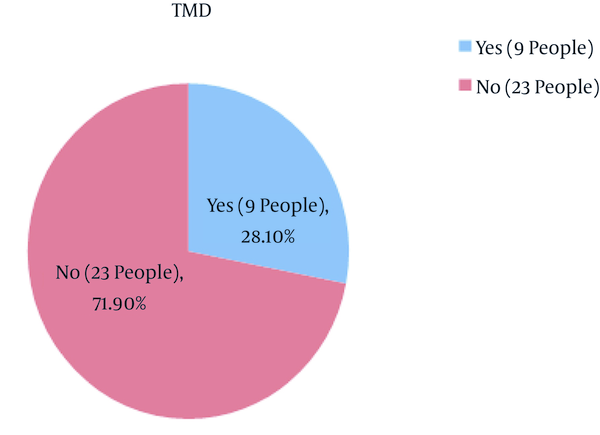 So prevalence rate of TMD in sample was 28.1% (9 persons) which are shown in Figure 4. Trauma is very common in athletes. It is reported that athletic events are six times, comparing to work events, and three times, comparing to drive events and violent acts, are the cause of wounds (13, 14). Athletic activity with high speed and severe strikes often result in bone fraction of face and activities with lower speed and strikes result in teeth damages (15) Most of the strikes on mandible do not result in fraction. But, the great pressure on joint disc and supportive structures may result in severe and generally constant damages. In several cases of trauma in TMJ, it may result in intra-capsular blooding and then joint enclosure (13). Entered traumas in TMJ could be classified in two main groups of macrotrauma and microtrauma based on the severity (5). Macrotraumas are any sudden powers incurring on joints and could change joint’s structure. Mandible break is one of the main results of TMJ’s macrotraumas. Severe and direct traumas causes inter capsulate disorders. If trauma occurs when the mouth is open, it may result in regressing of condyle from fossa. Loosening of ligaments as a result of severe strikes may cause disc displacement and outbreak of symptoms like joint noise and/ or joint locking. Any direct or indirect trauma on the joints may change balancing and occurrence of several problems such as effusion, hemarthrosis, dislocation of a joint, cohesion, ankylosis, internal derangement, breaking and also limitation or deviation during mouth opening. Macrotraumas can occur, during mouth closure, in this situation, teeth involving and keep jaw condition, so fewer damages incur on condyle disc set. In severe traumas, although ligaments may extend, joint surfaces will be under pressure and resulted in slipperiness, joint tension or even locking (1, 16). The most prevalent TMJ indirect trauma occur during drive accidents in relation to neck damages, resulting from sudden and severe bending towards back and forth, and resulted from a sudden pressure on the joint which is not a trauma directly to the mandible. Any low pressures that occur on joint structure in a long term repeatedly are called microtrauma. As a result of excessive pressure collagen strings are scattered and cause decreasing in ProteoGlycan- Water Gel and finally loosening of joint surface, which is called chondromalacia. This continuous pressure results in fibrillation in some points that may result in localized toughness of joint structure and change slipping capability of joint surface, and may result in thickness of joint surface. Microtraumas could result from pressure on joint, as a cause of muscular activity during mouth habits, like bruxism. As a result of long and continuous bruxism, joint tissues adjust according to the pressure and no changes are occurred. But, if the bruxism exacerbates, and the tissues don’t have the capacity of adjustment, it can cause severe effects (5, 16). Clinical TMD symptoms, based on involving structures, are tissue, TMJ and teeth. Damages will outbreak in the structures with the lowest tolerance. Structure tolerance depends on anatomy, previous traumas and local conditions of the tissue. Muscle attacks are figured as muscle tenderness and pain in mandibular movements. Pain is often together with exhaustion and spasm. Pain outbreak is attributable to freedom of several pain stimulus factors such as bradykinin and prostaglandin. Muscles’ function disorders incur as decrease of mandible movements scope. Joint attacks may be together with joint tenderness and pain and/or joint movement with noise. Teeth attacks outbreak as teeth movements or erosion; Teeth movement is as a the result of losing bone support and severe pressures (17). In the present study, because of lacking similar paper, comparison of the findings is not possible then data are interpreted more. In this study, 32 athletes with average age of 23.75 ± 2.21 and sport experience of 8.6 ± 2.38 were examined about TMD symptoms. Among clinical manifestations, the most prevalence symptom is pain in front part of the ear (%25). Based on the clinical examination, the most prevalent sign was the right joint click with 8 cases (%25). In amount of frequency of the athletes with at least one symptom was estimated 28.1 (9 persons). In this study, athletes who had at least one of the clinical symptoms was considered as TMD patients. Here, the most incidence of TMD is trauma in mandible. One factor relates to the kind of sport. Generally, injury risks in involving sports are higher than other athletic. Another factor is the events happening during the sports. In all of the events, without consideration of trauma origin, direct strikes on mandible may result in joint dislocation, masticatory muscle inflammation and loosening of ligaments and TMJ damages (17). Stress, is a TMD causing factor in athletes. Stress and homogenous trauma influenced on general temporal areas. Each of them increases masticatory muscle activity and joint spasm. The spasm pressure the disc, caused posterior ligaments’ extension and adjustment (18, 19). In this study, the average age of the athletes, suffering from TMD (25 ± 2) was higher than average age of the athletes without TMD (23.26 ± 2.4). Average of boxing record of the athletes with TMD (10.44 ± 2.79) was higher than average of boxing record of the athletes without TMD (7.86 ± 1.76). In present study, it is found that all of the evaluated athletes were using mouth guard in boxing. The guard could protect teeth and periodontal structures against damages. Using it will result in decreasing the pressure by mandible to TMJ. It is reported that in some sportive activities, not using of mouth guard increased face and mouth damages up to seven times (19, 20). According to the present study, the group under the investigation was influenced by expected trauma, and also all of them used teeth guard, it is recommended to do studies that evaluate the effect of unexpected trauma on TMD outbreak and also laboratory and Para clinic assessment to evaluate relationship of TMD clinical attack with structural changes of temporal-jaw areas. In this study, strikes in head and face in boxing often were in eyebrow and ears, upright or frontal (forehead and its sides). So, pain in front of the ear allocates %25 of the complaints. Considering that most of the boxers are right-handed, but existence of %25 in the right TMJ may demonstrate transfer of the strike from left TMJ to the right one or left upper-cut strikes, which are often incurred by the left hand in the upright surprise attack. This survey, subjective symptoms were 3% more than objective symptoms, so generally pain was the main complaint of the boxers. Teeth guards that the boxers are obliged to use result in the lower jaw was in centric occlusion in boxing and transfer the strike to TMJ areas and outbreak of TMD became the least (23 negative case against 9 positive cases). TMD in age group of 21 - 25 year old was lower than age group of 25 - 27 and this shows that personal guard experience against the hits in older boxers are not TMD occurrence factor and/ the younger boxers (because of lack of experience) were not able to strike more powerful hits. This finding about membership record in the national team is also correct (membership average of 14.5 years against 10 years).